In 2013 we were surprised to find both tea and olives grown commercially in Britain. At that point we had assumed that we had uncovered the furthest reaches of UK farming’s diversification. Then The Wasbai Company comes along and throws us a curve call. British farming, you never fail to surprise us! Let’s first of all set the record straight – it is unlikely that you have tasted ‘real’ wasabi. The green paste you get at your local sushi restaurant is more than likely common horseradish dyed green. We love Japanese food and so we were really excited to try our first taste of proper Wasabi. There is nothing simple about farming Wasabi. Wild wasabi grows alongside mountain streams and takes advantage of the abundant supply of nutrient rich water, with a high, dissolved oxygen content. Optimum conditions for growth require the right balance of sun, shade and water flow at different times of the year. The Wasabi Company have pioneered a system to mimic these environmental conditions, on their farm in Dorset, using their experience as the UK’s largest producer of watercress. 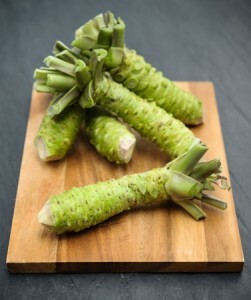 It is, arguably, their experience growing this other difficult crop that ultimately made them the first people to grow Wasabi commercially in Europe. However, fresh wasabi is also a temperamental cooking ingredient. If exposed to the air for longer than 15-20 minutes it loses its flavour, it does not store for longer than 2 weeks in the fridge (when wrapped in muslin cloth) and rinsed daily. Processing the wasabi officially requires a wasabi grater but we simply used the finest part of our common cheese greater. The idea is that you form a really thin paste using a circular motion on the greater and it is this paste that you use in your cooking. Again, you must only process the wasabi if you intend to use it immediately. The fresh Wasabi is sold in ‘rhizomes’, a green root stem, measuring about 5 inches in length (50g). It comes tightly wrapped in a damp muslin cloth and delivered with some very clear instructions on it’s use. Including delivery, the cost of one rhizome was around £16.00. Yes, this is not a cheap ingredient. MrsB and I challenged each other to try a thin sliver of the wasabi cut strength from the root. We both expected a nostril burning hit of heat but it was actually quite bearable, more like a hot radish. The flavour is much milder and far sweeter than horseradish but you can tell it is of the same family due to its earthiness. Our first dish we cooked was a fried salmon (recipe coming shortly) for which we used about half of the root. The remaining root we added to mayonnaise which was recommendation from a follower on Twitter. This we used in a number of meals over the next couple of days, including a rather decadent fish finger sandwich! So, would we recommend British wasabi? Of course! Yes, it is hard to cook with and store but that is all part of the ceremony of using it and yes, it is expensive but if you are looking to give your food an extravagance on a special occasion it is well worth it. This is fantastic news. Can I also introduce you to Hodmedods.co.uk The only company growing British Quinoa and other pulses. They are also making British Baked Beans!! Yep, we know Hodmedods but look forward to the baked beans! I think they were featured on Country File a couple of years back, although I thought the producer they met was in the Meon Vallley, though I am probably wrong on that . Fascinating stuff.